After following Shell Oil’s drill rigs throughout 2015 and the many kayak, land and aerial demonstrations of citizen opposition to fossil fuels, we documented the Paris climate talks at COP21, including street action and the negotiating halls. Doug Tompkins, preserver of South American wilderness, a “one-man Nature Conservancy,” leader of the modern deep ecology movement, and one of the founders of the modern outdoor adventure clothing and fashion industry, died December 8 in a kayak accident in Chile. He was among old friends, according to reports, doing what he loved, on a lake in a mountainous, forested landscape he was helping to preserve. High winds drove five foot waves into the kayaks, and Doug and his partner in a double-kayak, mountaineer Rick Ridgeway, capsized 200 yards from shore. By the time party members and a local helicopter brought Doug to shore, he had been in the frigid waters for two hours. Medical teams were unable to revive him from severe hypothermia. Please look here for a remembrance of this friend and mentor. 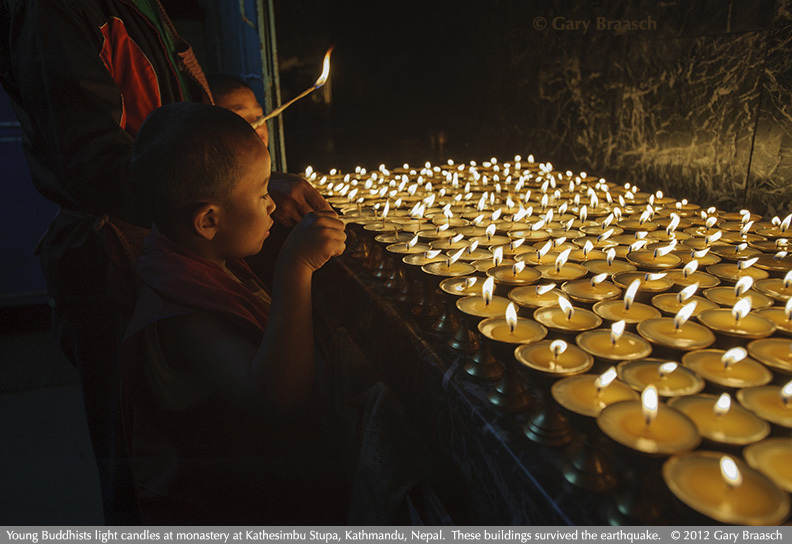 Tribute and Celebration of Nepal — Photography by Gary Braasch — Sales to benefit earthquake recovery. 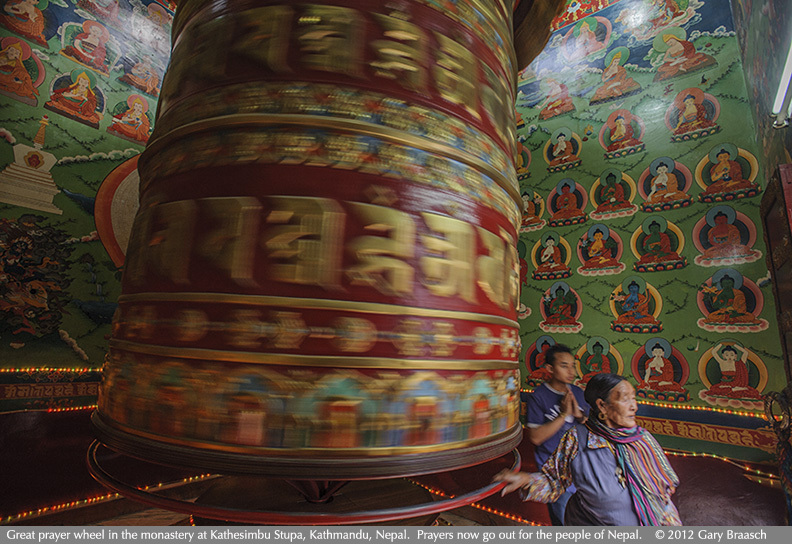 The portfolio images were made in Bhaktapur, Nepal, in March and November 2012. They are offered now as a tribute and celebration of the spirit of the Nepalese after the damaging earthquake in April 2015. Viewers are invited to purchase prints or license rights for publication — our net proceeds will be donated to offer the most direct aid based on advice from our friends in the Bhaktapur area. The toll in lives from the earthquake is now 8,675 people. In Bhaktapur, an ancient city and World Heritage Site, reportedly about 267 people were lost and perhaps a quarter of its old brick and tile buildings destroyed. 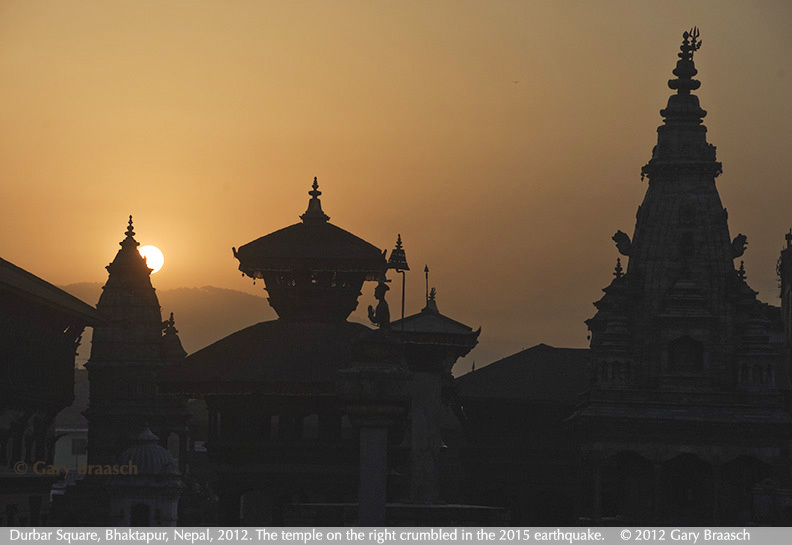 A number of temples fell in the quake, but most of the sacred architecture survived. Please see the Assignment Portfolios: Nepal for more. Our thoughts and hopes for safety go to our Nepalese friends in Kathmandu, Bhaktapur and up into the Langtang Valley, who were our guides, interpreters and subjects for the series of photo stories on World View of Global Warming. More will be posted as we learn about how the homes and villages in Nepal where we visited in 2012 were affected by the earthquake. Alaska photography and news, 2015: The President moves to protect more of the Arctic National Wildlife Refuge and Mt McKinley is renamed. As Shell Oil was drilling unsuccessfully for oil in Alaska’s Chukchi Sea, thousands of protected Pacific walrus were forced ashore on sandy Alaska beaches due to lack of sea ice. Sunrise over the Amazon, part of new journeys and science reporting by Gary Braasch and World View of Global Warming. Travel in 2014 by Braasch Photography and World View of Global Warming spanned from Peru to Europe. In Peru we documented a glacier in the Andes completely melted away, migrating trees in the Amazon cloud forest, and how the richness of the tropical forest links with rapid climate change. 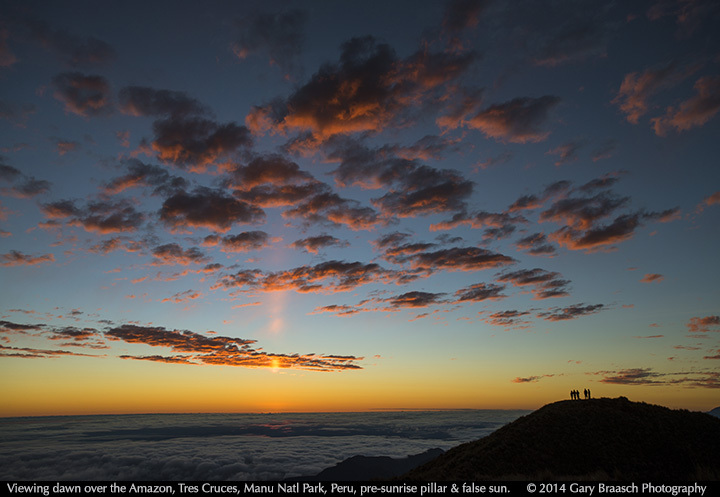 In the photo above from Manu National Park, we gathered with scientists Miles Silman and Ken Feeley and their Peruvian colleagues to see the sun rise over the Amazon from Tres Cruces. Here at more than 3600 meters / almost 12,000 feet one can view down across the entire range of Amazonian biodiversity, from cloud forest to the lowland jungles across Brazil. Moisture in the air usually obscures the long view -- but provides intense optical effects as sunlight is bent, reflected, refracted and revealed through clouds. Part of the World View of Global Warming journey to Peru was a visit to a weaving community at 13,000 feet in the Andes above the Urubamba River near Cusco. Thanks to the vision of Nilda Callanaupa Alvarez, her sister Flora and other artisan weavers at the Center for Traditional Textiles, the village of Accha Alta has been encouraged to return to very traditional dyes and patterns in weaving with the fine wool of the region. This area of the highlands also is seeing less snow, changes in stream flow, and a need to grow potatoes in fields higher up the treeless slopes. In Europe, we rephotographed science and shrinking glaciers in the Alps -- seeing great changes in only a decade since we first imaged these landscapes in 2004. Changes in the energy landscape across Europe are also apparent, which became part of our article on new energy sources and how to reduce carbon emissions to near zero. World View of Global Warming partner Joan Rothlein had a photo used in the Venice Biennale of Architecture in 2014 -- and we opened a 30-print exhibition on climate change in Munich. For more time series visualizations of how climate change is altering the face of the earth right now, try the new App for the iPad and the iPhone -- Painting With Time: Climate Change. 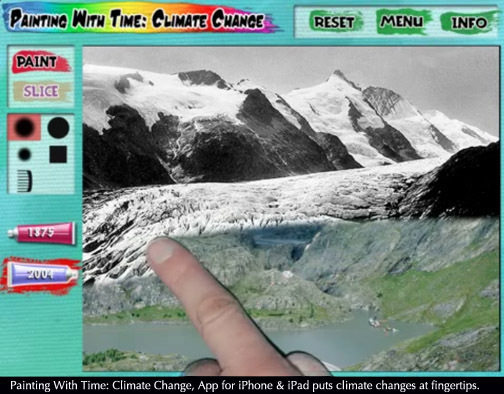 Created by Red Hill Studios and World View of Global Warming, and available now at your Apple App Store -- where it is "What's Hot" in the Weather section. With a sweep of your finger, see glaciers melt, sea ice disappear, coasts erode, reservoirs dry up, and world temperatures soar, along with information about the science of climate change from leading researchers. For more information, please see the App developer's facebook page.